Sweeping WW1 story of real-life British soldier (O'Toole) who brought the Arabs into the Allied camp, lead guerilla desert campaigns, and helped bring down the Ottoman Empire. David Lean (who also won the Oscar for direction). With Jose Ferrer, Anthony Quayle, Claude Rains, Arthur Kennedy, Donald Wolfit, and Michel Rey. Sam Spiegel (1901 - 1985), born in Poland, who's been in Hollywood since 1941 and has produced three Best Pictures: ON THE WATERFRONT (54), THE BRIDGE ON THE RIVER KWAI (57), and LAWRENCE OF ARABIA (62). Spiegel's other works include: TALES OF MANHATTAN, THE AFRICAN QUEEN, THE CHASE, THE NIGHT OF THE GENERALS, NICHOLAS AND ALEXANDRA, and THE LAST TYCOON. John Box, John Stoll, and Dario Simoni received the Art Direction/Set Decoration (color) Oscar. While Fred A. Young was awarded the Oscar for Color Cinematography. Anne Coates received the Oscar for Editing. Maurice Jarre received the Music Score (Substantially Original) Oscar. In addition, John Cox got his award for Best Sound. 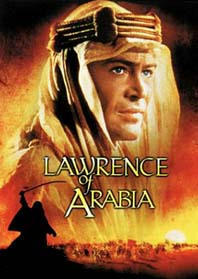 Please note: the producing/directing team of Sam Spiegel and David Lean delivered two Best Pictures: BRIDGE ON THE RIVER KWAI and LAWRENCE OF ARABIA. Marlon Brando was the first choice to play Lawrence, but he was filming MUTINY ON THE BOUNTY. Much of the story was filmed in the Sudanese desert.